Kitschy, with a B-movie feel to it and yet somehow oddly entertaining. I think the more recent Dredd 3D film nailed the original work a lot more accurately than the Stallone movie of the early 90s. Anyway, watching the more recent film peaked my curiosity and I had it on good authority that this was the best introduction to the Dredd universe......meh. I appreciate the universe created by Wagner here and there's certainly a lot of potential, but the characters are caricatures and the protagonist never in any real danger in spite of the insane situations he finds himself in. The deus ex machina is invoked far, far too many times and it seems like Dredd is able to solve cases and know exactly what happened and who's responsible the first moment he views a crime scene. Often times the only thing that remains is finding some pesky evidence with which he can feel vindicated when he dispenses justice. 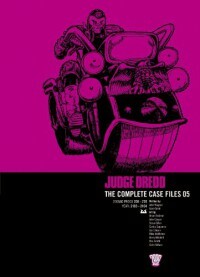 The first half of this collection is a nice introduction to the Dredd Universe, mainly consisting of one-shots that give highlights of types of crimes that are commonplace in Megacity One. It also introduces the character to the main players who have significant roles in the major, multi-issue Dredd story arcs. The second half is the Apocalypse War - a 10 issue story in which East Meg One (the former Soviets) launch a surprise nuclear attack on Mega City One and the Cold War plays itself out to horrific consequence. Wagner gleefully kills off a billion inhabitants of his universe between the two sides and the Judge becomes a military commander. There's nothing really unexpected or even particularly interesting about the way the war plays out, even from a science fictiony tech perspective. Amazing miracle weapons are countered by even more amazing and physically impossibly weapons and Wagner writes of the invention or progression of story in significant areas with a wave of the fingers. This is probably something you had to grow up with to really love and appreciate. For the price, there's certainly a lot of comic here if it's your thing. I think my approach was altogether wrong. Now that I've got a sense of Wagner's work, I think I might stick to reading just io9's 11 essential Dredd stories and skip the rest. Granted, the bulk of these stories are from the early 80s, but they didn't age very well. Here's hoping the more modern stuff has some depth.